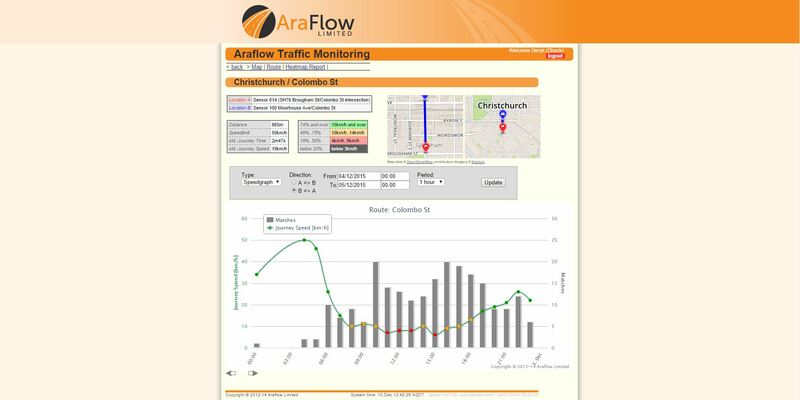 AraFlow Ltd provides our clients with comprehensive transport data collection, analysis and reporting services. We utilise our own exclusive data management software and communications infrastructure integrated with any sensor technologies. Our exclusive state of the art technology uses Bluetooth and mobile networks communicating with servers to monitor traffic in real time, as well as record and analyse traffic trends over time. This world leading technology is fully developed and operational, from the sensor collecting data in the transport corridor, through to customer report delivery via a web based reporting portal. Through this portal you can view: a real-time congestion map; historical data for both traffic speeds and journey times in tabular and graphical formats; and a whole host of other features from route reports to heatmaps tailored to suit the needs of your project. Then you can take the next step and export your data in csv format for simple application elsewhere. AraFlow leases hardware and provides consulting to support projects providing a cost effective solution, tailored to the needs of the project. Both the infrastructure and software is highly configurable and designed to meet the needs of any client, whether monitoring or measuring real time traffic.